This standard includes all the requirements for laboratories, which aim to demonstrate that they are employing a management system, are technically qualified and are able to produce valid technical results. Employing this standard enables the creation of cooperation between laboratories and other institutions, mutual exchange of know-how and experience and harmonization of standards and procedures. 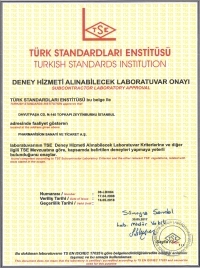 PharmaVision Qualification, Validation, Adjustment-Control Calibration Laboratory has decided to implement the quality system in line with TS EN ISO/IEC 17025 standard and with the support of the executive management has applied this system starting in 2008, in order to use internationally-accepted procedures, increase the reliability of experimental services and improve in performance. In order to meet all the requirements of TS EN ISO/IEC 17025 standards, documented procedures have been established within the institution with the aim of increasing the customer satisfaction resulting from high quality and reliable experimental services. build the basis of our actions. To apply the principles of the quality management system with the commitment of all our associates and prevent any possible factor which may have a negative effect on test results. To benefit from the expertise of our specialist team while using proper test equipment as given in test instructions and standards; fulfil the received test requirements in the highest percentage possible; conduct and result the tests in the most accurate way by using necessary reference standards, provide a sustained and high level of test quality, prevent eliminate any possible customer complaints to maintain full customer satisfaction. We hereby declare that, we will comply with the requirements of TS EN ISO/IEC 17025 standard and provide all necessary resources for the sustainable development of the quality management system.